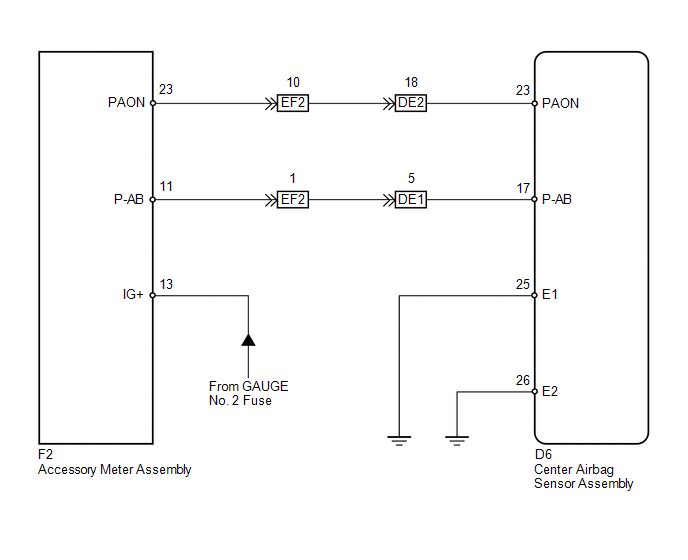 The passenger airbag ON/OFF indicator circuit consists of the center airbag sensor assembly and accessory meter assembly (passenger airbag ON/OFF indicator). The passenger airbag ON/OFF indicator indicates the operation condition of the front passenger airbag and front seat belt pretensioner RH. 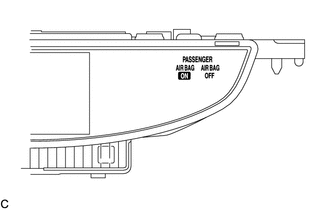 DTC B1660/43 is stored when a malfunction is detected in the passenger airbag ON/OFF indicator circuit. 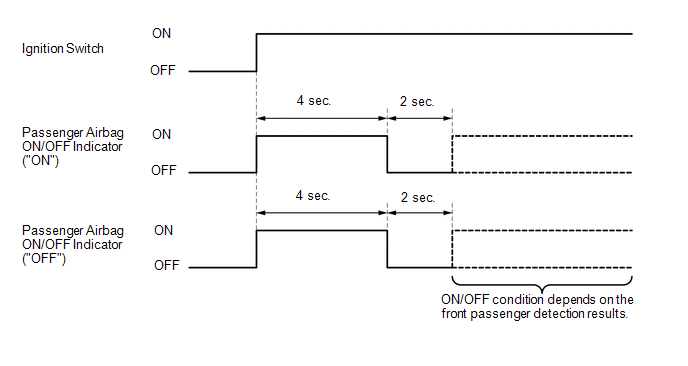 The center airbag sensor assembly receives a line short circuit signal, an open circuit signal, a short circuit to ground signal or a short circuit to B+ signal in the passenger airbag ON/OFF indicator circuit. (b) Check the passenger airbag ON/OFF indicator operation. Refer to the normal condition of the passenger airbag ON/OFF indicator (See page ). (c) Check that the connectors are properly connected to the center airbag sensor assembly and accessory meter assembly. 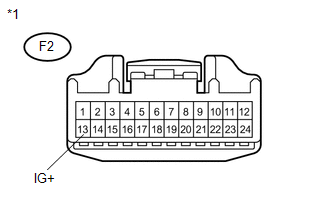 Also check that the connectors that link the instrument panel wire, No. 2 instrument panel wire and No. 3 instrument panel wire are properly connected. (d) Disconnect the connectors from the center airbag sensor assembly and accessory meter assembly. Also disconnect the connectors that link the instrument panel wire, No. 2 instrument panel wire and No. 3 instrument panel wire. (a) Connect the connectors that link the instrument panel wire, No. 2 instrument panel wire and No. 3 instrument panel wire. (b) Connect the connector to the accessory meter assembly. (e) Check the passenger airbag ON/OFF indicator operation. The passenger airbag ON/OFF indicator does not come on. 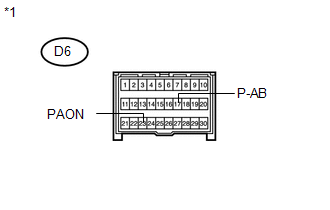 DTC B1660/43 is not output. Codes other than DTC B1660/43 may be output at this time, but they are not related to this check. (c) Connect the connectors that link the instrument panel wire, No. 2 instrument panel wire and No. 3 instrument panel wire. (d) Disconnect the connector from the accessory meter assembly. 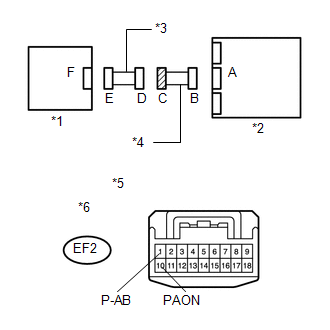 (e) Using SST, connect terminals 23 (PAON) and 17 (P-AB) of connector B. 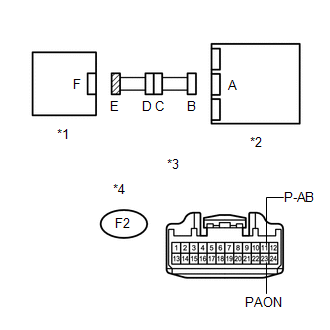 (b) Using SST, connect terminals 23 (PAON) and 17 (P-AB) of connector B. (c) Connect the connector to the accessory meter assembly. 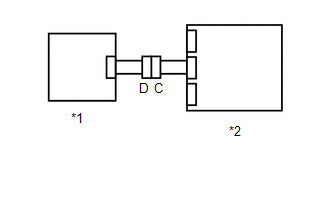 (f) Check the indicator according to the conditions in the table below. (c) Connect the connector to the center airbag sensor assembly. (a) Disconnect the wire harness from the No. 3 instrument panel wire. SST has already been inserted into connector B. (c) Disconnect the wire harness from the No. 3 instrument panel wire.